Want to make your home look really spooktacular this Halloween? Make sure you follow these steps. Now that fall is here, one of the most loved American holidays is just around the corner! Halloween is the second largest grossing commercial holiday after Christmas. But that being said, Halloween just doesn’t seem to be the same as it once was. The dedication to creating truly spooktacular decorations seems to have gone by the wayside. But it doesn’t have to be that way… you can pave the way towards making Halloween great again! And here’s how to do it. The best Halloween houses in the neighborhoods always seem to have a few things in common. One, good candy, and two, a killer theme (pun intended). If you really want to wow your trick o’ treaters, pick a motif and stick to it. Sure, you could go with “haunted house,” but consider other themes as well, such as an insane asylum or an extraterrestrial crash site. Utilize as much of your outdoor space as possible. For example, if you have garage space you can use a black drop cloth and lights to create a mini “stage” that works with your chosen theme. For example, you could set up tables with beakers and other instruments for a “mad scientist” effect or create an alien experiment den. The more creative, the better! I mean, really, who doesn’t want to be known as “that house” in the trick or treat circles. Of course, this should go without saying, but…costumes. You have to be in costume, no if, ands, or buts about it. And, if you really went for it with your theme, you don’t have to get too complex with your costuming. There are lots of easy options out there; for example, a skeleton costume is always a classic, or of course, a vampire or ghost are solid go-tos as well. However, there is something to be said about a really put together costume. Some of the most terrifying Halloween houses are those that look entirely undressed except for the person sitting quietly on the front porch in their full, demonic gear, candy bowl in hand. This tip is for the ultra-advanced Halloweeners, so proceed with caution; however, all the best trick or treat houses played up the “trick” part of that equation. Meaning, they make their visitors work for their treats. 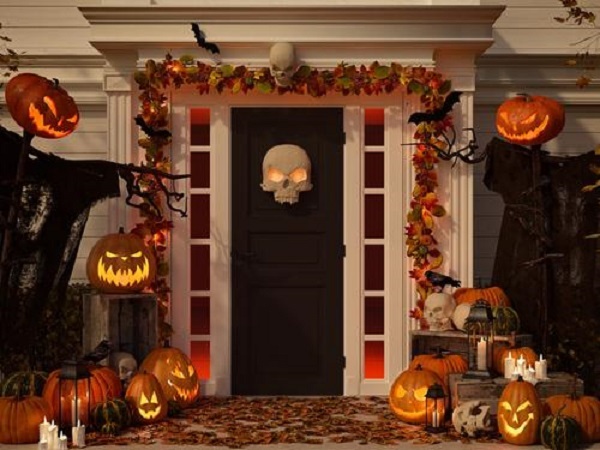 Typically, most trick or treaters are relatively young kids, so you may want to reserve your extra levels of scare factor for the older kids, but utilizing the element of surprise is a surefire way to make your house one of the most memorable on the block. For example, consider creating a mini “graveyard” along the path to your front door. Here’s what you’ll need: a few headstones from a Halloween store, flowers, potting soil, and black tarp. Using the soil create one faux grave by making a mound and covering it with the tarp. Decorate around it using the flowers. Set up the other headstone and flowers as well, however, instead of using soil for the second grave, lay under the tarp and when unsuspecting trick or treaters walk by, you can “rise from the dead” at the most opportune moment. (Note: this is where a skeleton costume would really play well.) The result? Halloween magic. When it comes to Halloween, it’s all about the atmospheric details. So, yes, a fog machine is always a good idea. As is the spooky, orchestral music. A few other easy ways to create the perfectly creepy atmosphere on All Hallows Eve is go for an “abandoned” vibe. Don’t mow your lawn for a few weeks and put plywood over a few of your windows. Combine any of the above points (your theme, your mini graveyard, and your costume) and you have the perfect recipe for becoming the creepiest house on the block. Which, in Halloween lingo, is pretty much the gold standard.